All account owners must sign their names exactly as it appears on the certificate(s). If the certificates and your Fidelity Brokerage account are identically registered, endorse the certificates exactly as registered and mail them to the address below. If the certificates and your Fidelity Brokerage account are not identically registered, please complete a Certificate Release Request. This page will open in a popup window. and endorse the certificates exactly as registered and mail them to the address below along with the Certificate Release Request. If you would rather not endorse the certificates, you can send them to Fidelity along with a completed Irrevocable Stock or Bond Power Form. This page will open in a popup window.. This form can also be used if you have already sent us certificates and were notified that they were not endorsed correctly. If the certificates are not identically registered, please complete and send a Certificate Release Request. This page will open in a popup window. as well. Write your Fidelity Account number in the top right corner of the certificate. 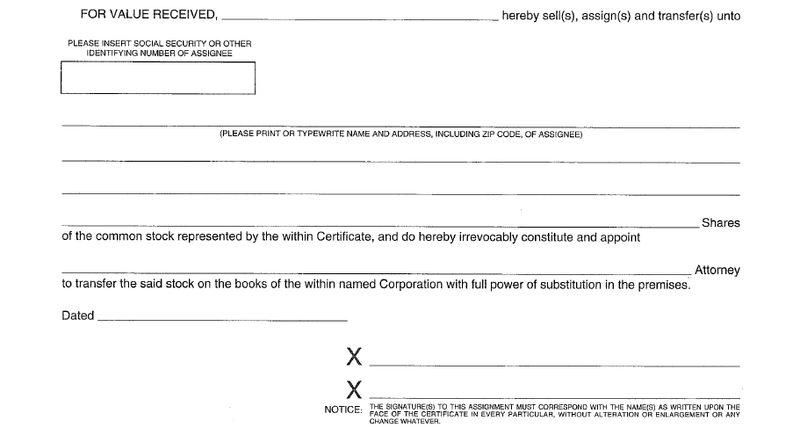 Write National Financial Services LLC in the blank space between "appoint" and "attorney" on the back of the certificate. All other spaces shown should be left blank (see example below). Please sign the back of the certificate exactly as your name appears on the front of the certificate. All owners listed on the front of the certificate must sign the back.